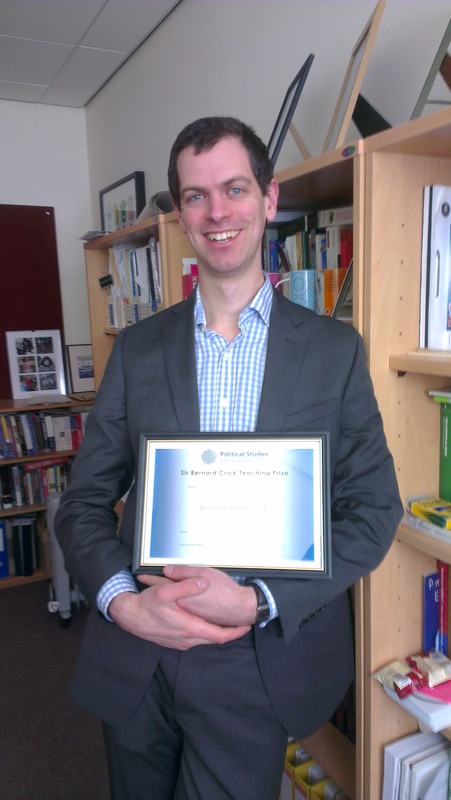 I won a prize last night: I am now the proud recipient of the Political Studies Association’s 2012 Sir Bernard Crick award for outstanding teaching. And since the judges did commend my use of online media, I guess it’s inevitable that I write a blog about it. It would be wrong to say that I haven’t been very gratified by the award. To receive the recognition of colleagues is always a personal and professional pleasure, especially with all the personal communications that I’ve had in the hours since. At the same time, it is also important to say such rewards are not my motivation: I teach because I love doing it and because I find it intellectually stimulating. With that in mind, my natural inclination is to reflect on the award and what it tells me (and – by extension – you). Three things spring to mind. Firstly, I find it instructive that a large number of previous winners have also had a focus on teaching European topics. My background is more European studies than political science, so I’m always aware of the huge range of teaching practice and pedagogies, but it might also be true to say that European topics sometimes requires more innovation to grab students’ attention. Secondly – and I’m aware this sounds very Oscars-ish – having the colleagues I do makes good teaching all the easier. Our School has such a positive environment in matters of learning & teaching that any and all innovation is welcomed, and then critically tested. Over the years, we’ve been able to try out most things you care to think of and we have been very generous with sharing our ideas with each other: I could not honestly claim that everything I do was all my own idea, because it emerged from that collaborative environment. Thirdly, this award has made me reflect on the position of teaching in universities. In the context of tuition fees, National Student Surveys, league tables and all the rest of it, teaching has to be front and centre in our work. I believe academics understand that, but still we find ourselves placing research first in our professional strategies. As the REF process has shown me, that can cause some issues, but still I find myself thinking that we have taken teaching seriously. If we don’t open our students’ minds to what our subjects can bring, then we risk becoming irrelevant or marginal and – in the longer term – cutting off the supply of young talent that we need to survive. I would say that this is squaring circles, but it’s not that at all: teaching and research are two sides of the same coin and feed each other. And with that, I’m off, to do another day in a job that I find endlessly enjoyable, whether or not I get an award.